A while back I posted a couple of songs by Mitchell's Christian Singers, one of my favorite vocal groups. I promised myself that I'd post their version of I'm Praying Humble someday. Chicago. 19 October 1938: Bob Crosby, conductor; Zeke Zarchy, Sterling Bose, Billy Butterfield, trumpets; Ward Silloway, Warren Smith, trombones; Irving Fazola, Matty Matlock, Joe Kearns, Eddie Miller, Gil Rodin, reeds; Bob Zurke, piano; Nappy Lamare, guitar; Bob Haggart, bass and arranger; Ray Bauduc, drums. Of course, you know that Bob was Bing's brother, right? The standard Web resources say that "(Bob) Haggart had found an old record of the piece by a black gospel group in a second-hand shop and reworked it for the trumpet of Sterling Bose." But that's all she wrote. NYC, 10 August 1937: Unaccompanied vocal quartet: William Brown, lead tenor; Julian Davis, tenor; Louis "Panella" Davis, baritone; Sam Bryant, bass. Discographical note: I'm citing only the first major issue of these records...many of these Mitchell records were also issued on ARC's dime-store labels (Perfect, Melotone, Oriole, Banner, and Conqueror) at roughly the same time...and many also show up on post-war red Columbias as well. Notice that the record really wasn't all that old at all...it came out the previous year. And, interestingly enough, the Crosby record substitutes an apostrophe for the "g" in "Praying." NYC, 28 April 1937: Same personnel. 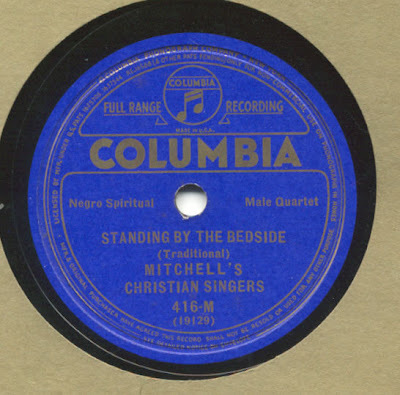 23879-1 My Poor Mother Died A Shouting Mitchell's Christian Singers Columbia 416-M NYC 28 December 1938: Same personnel. Question #1: Did anybody notice that this was issued in Columbia's pricier Masterworks series (usually reserved for classical music)? There's a good reason for it...hats off to the first person to tell me why (and that lucky person will also receive those Special Aged Peanut Butter Sandwiches from Uncle Eugene). Here's a (very) big clue: The next record in the series, Columbia 417-M (which I've never seen on 78) was issued by "Sanders Terry." Here is another pair of sides, one by the Mitchells, and the other from the old double LP of The Fabulous Dorseys in Hi-Fi. The former was one I had posted a while back. I was reminded of it when I was transferring the Dorsey LPs and recognized the title. NYC, 7 July 1938: Same personnel. Someone asked me why I call this International music "ethnic" but don't include jazz or blues under this heading. It's a personal thing...Jazz and blues have been assimilated into the mainstream of American music, and the music represented in this section really hasn't. And I never really liked the term "World Music." It reminds me of another term I don't like much..."New Age." 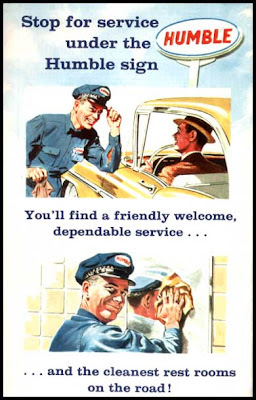 I prefer to omit the space and combine the words...to rhyme with "sewage." 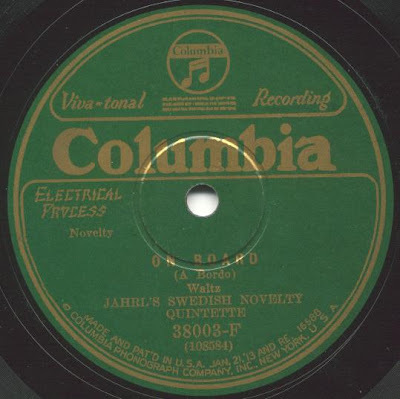 I was asked recently to post a label scan (and mp3) of the flip side of the Eddy Jahrl record I posted last month. No Hawaiian guitars here, but some pleasant xylophones make up for the lack. At least they're not bagpipes, eh? Question #2: What can you tell me about this record? What's its nationality? Where was it recorded? When? What instrument is that, anyway? The person with the most correct answer gets to share those sandwiches with the winner of Quiz #1...unless, of course, one of you wants the Komodo Dragon.